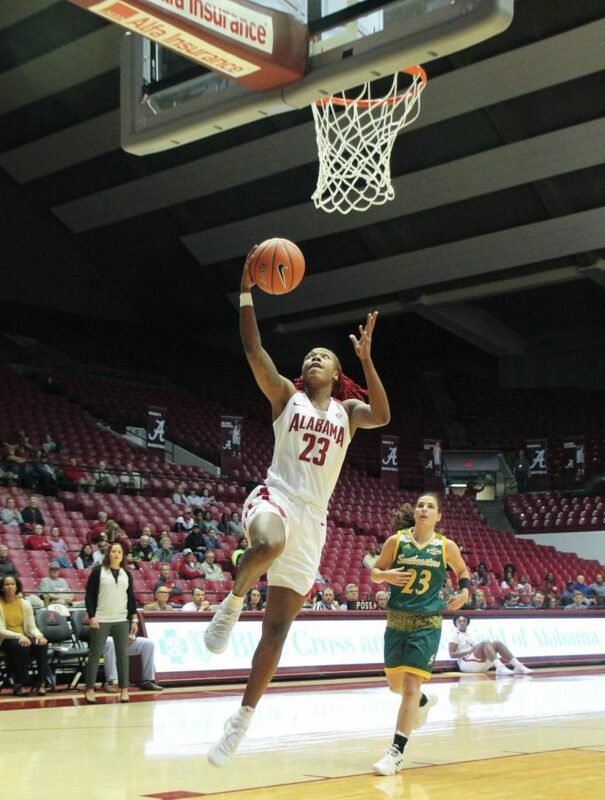 Alabama women’s basketball opened its regular season with a 88-40 win against Southeastern Louisiana. It’s the biggest win over the Lady Lions in the two team’s history. During the preseason, the Crimson Tide was looking for consistency and fixing the little things to start the season on a good note. Alabama was led by senior Shaquera Wade, who scored her most in a season opener with 20 points. She shot 9-for-13 along with seven rebounds and two assists. Following her was junior Jasmine Walker with 12 points, and 13 rebounds recording her first career double-double. Freshman Allie Craig Cruce finished with 12, and junior Jordan Lewis had 10. From the start, Alabama took control of the game leading 21-8 going into the second quarter and extending that lead to 27 by halftime. During the first half, the Crimson Tide shot 47 percent going 16-for-34. Southeastern Louisiana went for 6-for-33 and 18 percent. Alabama finished the game shooting 28-for-62 and 45 percent from the field while Southeastern Louisiana shot 13-for-67 and 19 percent from the field. The Crimson Tide out-rebounded the Lady Lions 51-31. Alabama tallied 12 assists and four blocks, three of them coming from sophomore Ariyah Copeland. Alabama finished 76 percent of its free throw attempts. Alabama is now 9-2 overall against Southeastern Louisiana, winning the last nine meetings. The Crimson Tide is 5-1 in season openers under Curry as head coach. Alabama is back in action Tuesday, Nov 13 against Utah. The game is scheduled for 8 p.m. in Salt Lake City.